So this was the Team Obama plan … send Joe Biden out to act like a laughing, unprofessional, mean spirited jerk. This might have been one of the most bizarre and contentious debate I have ever had the displeasure of watching. From the outset of the Vice-Presidential debate Joe Biden was a condescending, laughing jerk. Biden’s tactics were obvious and over the top. GOP VP candidate Paul Ryan did not fall for it. Ryan stayed the course and tried to make his points as he was continuously interrupted by not only Biden, but the moderator Martha Raddatz as well. At one point as Biden as acting a a childish, smirking manner, Ryan commented with the following back-slap. “I know you’re under a lot of duress to make up for lost ground, but I think people would be better served if we don’t interrupt each other,” Ryan later scolded his rival, referring to Democratic pressure on Biden to make up for President Barack Obama’s listless performance in last week’s debate with Mitt Romney. However, what was most amazing and just mind-blowingly disrespectful was Biden’s laughter and smirks as the moderator asks serious questions on the economy, unemployment, a nuclear Iran and war in the Middle East. Oh yea, these are laughing matters. People are out of work, losing their homes and businesses and our brave military is waging a war on terror and this goof laughs and smirks during the debate like the village idiot. 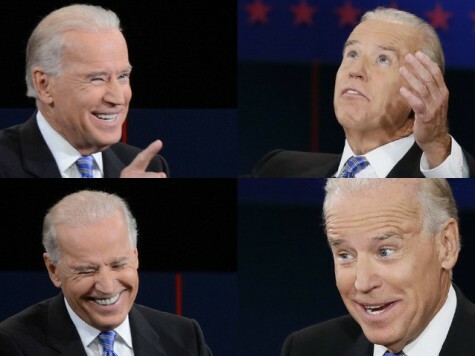 Even more amazing is the MSM reaction to Biden’s smirks and teeth blinding laughter. Check out the following tweets from the liberal MSM via Breitbart. If the liberal in the tank for Obama reacts like this, imagine how Independents are thinking? Will Vice-President Joe Biden Challenge Hillary Clinton with a 2016 Presidential Run? Joe didn’t care how foolish he looked to an audience. He was trying to dominate the time and of course in that he succeeded. What a fool! The court jester saying “Look at me”. Don’t look at him. DNC chair Priebus counted 82 interruptions of Ryan by Biden in 90 minutes. Where was the moderator? In the tank for Biden and Obama. Fox News anchor Chris Wallace hammered Vice President Joe Biden’s excessive smiling and laughing during the debate, saying that he’s never seen anyone be so disrespectful in a presidential or vice presidential debate. “I don’t believe I’ve ever seen a debate in which one participant was as openly disrespectful of the other as Biden was to Paul Ryan tonight,” Wallace said. If you put them all together and you end up with television where you saw the demeanor that the Vice President had in regard to Ryan, I think that undid the advantage in rhetoric that he had in carrying the debate. It was so disrespectful. I agree with Chris Wallace, it was sort of almost unprecedented and hugely condescending. I think that undid the force of his arguments and I think in the end, if television, you lose. Tonight Ryan was required to debate both the Vice President and the Moderator. Ryan took the high road and emerged the victor. It was disgraceful the way he constantly interrupted Ryan as he tried to answer the questions! Biden showed the real problem we have with the present administration….they laugh off the serious issues and make fun of others who don’t agree! It’s hard, if not impossible, to picture Obama and Joe Biden accomplishing anything the people would like if they got 4 more years! I like Romney and Ryan….class….not clowns. Obama performs the same way out on the campaign trail. It’s true they can’t run on their record, so they try to belittle the opposition. It drives me crazy to hear o and joe take credit for things others did, especially in Iraq and Afghanistan. I have seen first year high school debate students put on a better performance than Biden. Thanks, Joe, you are the best! Ryan lost – through being subjected to the same tactics Romney used last week and you cheered, but this time by somebody who’s better at it. Oh my. His career will never recover. What a shame. SM: You really think the two are comparable? No wonder you are for Johnson. BTW, Ryan did not lose.